This is a guest post from Mike at Homeless on Wheels. Decluttering and minimalism guides frequently offer a blanket recommendation that single purpose items should be replaced by multi-function devices whenever possible. I might agree if the primary goal is to own the fewest possessions, or if you are trying to cram maximum functionality into minimum space and/or weight, perhaps for travel. If your real goal is simplifying your life, however, sometimes owning a few more things can make life simpler and easier. One of the earliest experiences I can remember of attempting to replace several items with one multipurpose device was when I was just a kid. I saw this cool pocket knife. Along with a knife, can opener, and scissors, it also had, believe it or not, a fork and spoon that each folded out for use! Well, that seemed like a great idea and I just had to have it. I couldn’t wait until my next camping trip to try it out. 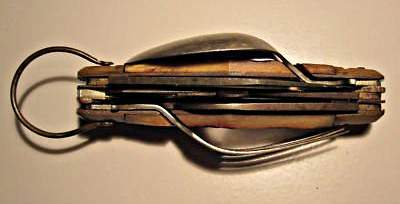 Unfortunately I learned that while it was a nice knife, and the fork and spoon each worked quite well, too, it just was not a very good replacement for three separate utensils when mealtime came around, as I was limited to using only one of the three at a time. While it saved me a few ounces in my pack and was two fewer things to carry and keep track of, it greatly complicated eating a meal. The modern smart phone can replace a number of individual devices. The most common, in addition to the basic phone, are a camera, GPS navigator, and media player. My phone does one thing. It makes and receives calls. Voice quality as well as reception are excellent. How does the smart phone compare? Smartphones are rarely ideal as telephones. Many have less than stellar sound quality, and poor reception and dropped calls are a common complaint, too. Battery life? I get seven hours talk time and two weeks standby on my “just-a-phone”. Smartphones, with their bigger screens and many features, measure time between charges in hours rather than weeks. The basic phone makes a better telephone, and it certainly is simpler. Most phone cameras are no match for even an inexpensive “real” camera, but when a photo opportunity presents itself, the best camera is the one you have in your hand. That said, is a camera phone any simpler to use than a basic point-and-shoot camera? One button turns on my camera, instantly, and a second button snaps the picture or starts shooting video. Phones tend to vary in level of complexity to access the camera, wasting time and possibly costing you the shot. If the phone is turned off, it takes even more time to boot up before you can use its camera. The point-and-shoot is simpler, and quicker to the draw, too. There’s no contest, in my opinion. The standalone GPS navigator beats out the smart phone on all accounts. The screen is often bigger. GPS device manufacturers have been doing this for years and their routing algorithms, presentation, and ease-of-use are far better than any phone has to offer. Considering that some smart phone navigation apps only operate when there is a cell signal available, and some carriers charge an extra monthly fee for navigation, the standalone GPS is the better and simpler option. This is one category where smartphones generally hold their own, and in some respects even outdo a separate player. They do a decent job at playing music and video. As an added bonus, you can buy new content instantly, wherever you are. Streaming audio and video make for a nice change of pace from your own library, but watch out for data overages if you are a heavy user. The ability to pause or mute the music automatically when a phone call comes in is great. Remember the pocket knife? In spite of it having a perfectly good knife, fork and spoon, it was useless come mealtime because I could only use it as one utensil at a time. It was multi-purpose, but not multi-tasking. While some phones might have the computing power to multi-task, can you really do more than one thing at a time on a four-inch screen? Not to mention that it is still a phone, so no matter what else you’re doing, it comes to a screeching halt when you get a call. Have you ever tried to take a picture or shoot video with your phone, only to have a phone call come in and ruin it? Or have the same thing happen while using your phone to play dinner music or DJ a party? Have you been late to an appointment because someone called, causing your GPS app to miss a crucial navigation maneuver? You get the idea. With individual devices, I have freedom of choice. I can choose exactly which phone, which camera, which GPS and which media player I want. And upgrade or replace any one of them at any time without affecting the others. Possibly more importantly, I have the freedom to choose exactly which devices I want to carry and use and when. I can leave the phone at home, or turn it off, while still having my camera. I actually find myself “forgetting” my phone more and more lately. My GPS stays in the car, stuck to the windshield, which is the only place I need it. Nothing to remember, nothing to plug or unplug each time I need it. And the music player? I don’t always need a running soundtrack for my life. I carry a basic Nokia phone, the virtues of which I have already extolled above, and a Kodak pocket camcorder about the same size as my phone that shoots HD video and 5 megapixel stills. GPS lives in the car and I haven’t carried a music player around regularly in years. I’ve learned to appreciate the sounds around me. I used a smart phone as an example that most of us are familiar with, even if we don’t own one. And my writing is based on my needs and my experience. Can you think of other situations where owning two or more single purpose devices might make more sense than owning a single multi purpose unit? Or do you think I’m totally off base? Please take a moment to comment on this post, then I hope you’ll visit Mike at his developing Homeless on Wheels blog. I want to preface by saying that I agree with the thesis of your post (“sometimes owning a few more things can make life simpler and easier”). That being said, I think the phone example is partly right-on and partly off-base. I’ve owned smartphones for the last 8 years or so, and my current phone is the first non-smartphone that I’ve had in that time. The current crop of smartphones (the Motorola Droid ones are what I have experience with) do most of the things you mentioned relatively well. I’d never had a problem with call quality on the Droid. Motorola phones, on balance, have fantastic antennas and signal. That being said, it is a bit bulky to hold up to your ear. I agree on cameras, to a point – you just can’t beat the lens quality on a regular camera (as opposed to the one built into a smartphone). For doing any photo that’s going to be published, put on a website, anything like that, you really need a good camera to get a nice, clear, sharp shot. That being said, if you configure your smartphone properly the camera can be very accessible (with a side button on the phone that kicks it on, rather than having to select an app). Showing your trophy bass to the kids later that day can be done with that just as well as with a regular camera. As for GPS, I never used it until I got a smartphone, and I still only really use it on long trips to places where I’m not sure of directions. I would never buy one as a standalone device; I just don’t have the need for it. The reason I don’t have a smartphone now is because I switched my mobile Internet activities to a tablet, and made my phone a regular, cheap phone (with a keyboard, so I can text and enter contacts without a bunch of hassle). I think there are many situations where this logic probably applies even better than with phones, and any way you look at it it’s good to be thinking this way. 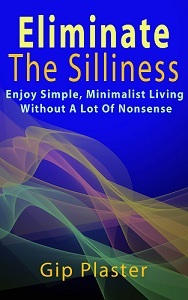 There’s no prize for having the smallest amount of items – so using that as the sole driving force for decisions (like some people do) is, as Gip would say, “so much silliness”! You’re right that maybe the phone wasn’t the best example, Robert. And now that you mention it, I have seen some phones with a dedicated camera button (handy feature!). And of course some people would have smart phones anyway, even if they didn’t come with a camera, etc., because they want to stay constantly connected and/or need to have a tiny portable computer and web browser with them. Now that you have a tablet and a simple phone, has the tablet taken over the role of camera, media player, etc.? Actually, the tablet took over the role of “information management and Internet connectivity”. I got sick of trying to check my GMail, Twitter, etc. on a Droid screen. The regular phone has an MP3 player built in (so if I want to go for a walk I can have music without needing to haul along a tablet), but I use the tablet for audio as well. Basically the phone does the bare, bare minimum for phone, audio and camera, and I use the tablet for everything else. The problem isn’t necessarily that printer/scanner/fax/phone/etc. combos are bad; it’s that the ones that are good cost proportionally more. In the first example above, you’re frequently getting a combination of a cheap printer, a cheap scanner, and a cheap fax rather than a single nice fax machine. In the second example, the scanner on the printer is an afterthought compared to the quality of the scanner that’s going for $150. *DISCLAIMER* – There are also pieces of office equipment that are just horribly overpriced. I’m not saying that more expensive always equals better. But I can attest to the fact that there are higher-end multifunction devices that do all of those functions exceptionally well, and absolutely blow the cheaper units out of the water for speed, quality, and reliability. Good example! I’ve had some disappointments with combo printer scanners. Only one that I personally owned, though (anybody remember the Xerox Document Home Centre?). Now it’s separates for me with those too. Multipurpose vs. multitasking. What an intelligent distinction that we seldom make. And which makes our lives simpler? Excellent point, because minimalism and living simply for me are not about the possession count, but in how easy my life can be. I am all about ease these days. Hi, Marti. Sometimes the difference isn’t obvious, or marketing tactics obfuscate it. Buyer beware, as they say. 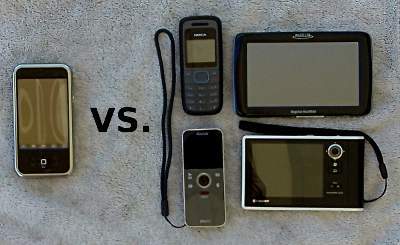 Multi-function vs single purpose or as Marti put it Multipurpose vs. multitasking – like quite a few of the active readers here for me its more about life simplicity than the numb of items i own. Can’t say I agree with your example though, in my experience moving to an iPhone from a position of having multiple devices or not at all has improved my quality of life. There seems to be some diverse experiences with multi-purpose devices here. For me, an iPhone and GPS are the ultimate in convenience. I still bring my bulky camera or digital movie camera when I know ahead of time that I’ll want to capture a moment, but for those unexpected moments, my iPhone does an acceptable job of capturing whatever I want to preserve. That said, I always prefer to carry the least number of items with me as possible. The one item I never leave the house without is my smartphone. I suppose it’s only right that I add in my few cents worth. I’ve never owned a GPS and I’ve never owned more than a dinky MP3 player. I don’t like to use headphones or earphones because they hurt my ears. My digital camera cost less than $60 on clearance at Target about five years ago and works great. But I never use it. My new $25 MetroPCS phone has a 1-point-something megapixel camera that works great. I even had a few prints made to see how the resolution is, and it’s wonderful. The phone also includes an MP3 player, apparently. It’s possible to have good function for almost no money. The ultimate quality of life, however, comes from living a life that doesn’t need to be constantly enlivened with music, in touch with other lives by phone or text or captured in images to be memorable. Oh, yes… that’s another advantage to my cheapie phone – I’m a lot less concerned about losing it or damaging it than if it was a $300 smartphone. I think I paid about $20 for it, no strings, no contract. Oh, and GPS is a must for me. I have a terrible sense of direction. I know I managed somehow in the pre-GPS era, but satellite navigation has really simplified my life and saved me time, at least whenever I have to drive in unfamiliar places. I just wanted to take a moment to thank Gip for hosting my post here, and to thank everyone for all the thoughtful comments.